By joining The Superbook Club. 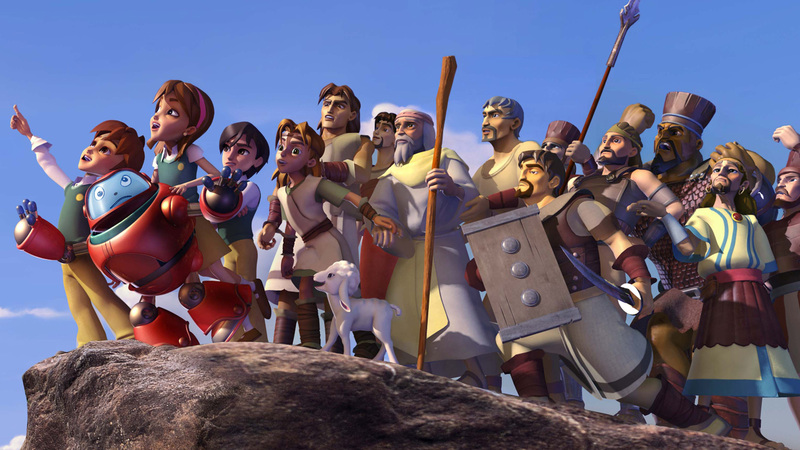 When you join The Superbook Club, you will automatically receive each new episode of Superbook. In addition, we will send you two free copies of each new episode in attractive packaging that you can give as gifts to others. Your tax deductible gift will also help produce future Superbook episodes and bring the Word of God to children around the world. Call 1-866-226-0012 or you can learn more about The Superbook Club here. I am a member of the Superbook Club. Why haven't I received my copies of "Revelation: The Final Battle!" yet? "Revelation: The Final Battle!" is a special feature and is not a part of the Superbook Club at this time. DVDs may be ordered individually at CBN.com or by calling 1-800-759-0700. Club members will receive 1 DVD plus 2 free copies for each .00 gift. Why did Jesus spit on the blind man’s eyes? It may seem strange to us for Jesus to spit on his eyes, but that is what the heavenly Father led Him to do. Jesus explained this when He said, “I tell you the truth, the Son can do nothing by himself. He does only what he sees the Father doing. Whatever the Father does, the Son also does” (John 5:19, NLT). As you know, the result was that the man’s eyes were healed. If the man had gone into the village, word about the miracle would have quickly spread. Jesus often performed amazing miracles, and if news spread about it, large crowds would surround Him so that He couldn’t publicly enter a town. As a result, He had to stay in secluded places (Mark 1:41-45). On the other hand, by telling the man not to go into the village, He could enter the village without large crowds being there. Why did Jesus call Peter “Satan”? In the original Greek language of the New Testament, the word “satan” can mean “adversary.” So Jesus was saying that Peter was opposing His divine purposes and mission. You can see this in what Jesus said to Peter: “Get away from me, Satan! You are a dangerous trap to me. You are seeing things merely from a human point of view, not from God’s” (Matthew 16:23, NLT). The beggar called Jesus the “son of David.” He shouted, “Jesus, Son of David, have mercy on me!” (Mark 10:47, NLT). David was the king of Israel, so the beggar knew that Jesus was in the royal family line of King David and had great respect for Him. It could be that the beggar’s cloak was old and worn, and he felt that it would not be proper to go before Jesus while wearing it. Why did Jesus put mud on the man’s eyes? It was a day of rest devoted to the Lord. The Bible tells us, “You have six days each week for your ordinary work, but the seventh day is a Sabbath day of rest dedicated to the LORD your God. On that day no one in your household may do any work” (Exodus 20:9-10, NLT). Which Bible verse is the basis for Superbook’s statement to Chris, Joy and Gizmo when they were traveling back in time to the Bible story? The verse is Proverbs 16:1 which says, “We humans make plans, but the LORD has the final word” (CEV). No. At that time, the Ark only contained the tablets. The Bible tells us, “Nothing was in the Ark except the two stone tablets that Moses had placed in it at Mount Sinai, where the LORD made a covenant with the people of Israel when they left the land of Egypt” (1 Kings 8:9 NLT). However, there was a time when additional items were in the Ark. The book of Hebrews states that when the Ark was in the Tabernacle, it also contained a gold jar of manna and Aaron’s staff. It says, “Inside the Ark were a gold jar containing manna, Aaron’s staff that sprouted leaves, and the stone tablets of the covenant” (Hebrews 9:4 NLT). While a number of translations say that Bathsheba bowed before him, the NASB says, “Then Bathsheba bowed and prostrated herself before the king” (1 Kings 1:16). Why would Bathsheba bow or lie on the floor in front of David’s bed? Although Bathsheba was David’s wife, she followed the customary rules of proper behavior toward the king. The rules called for someone to bow before him and then wait for him to speak before sharing one’s request. Why did Bathsheba call her husband David “my lord” and “your Majesty”? Why did Solomon ride King David’s mule to Gihon Spring to be anointed as king? Mules were ridden by all of the princes, but riding the king’s mule without special permission was strictly forbidden. Therefore, when Solomon rode it, it showed that he had King David’s favor as the future king. What was the glow around Solomon after oil was poured on his head? The larger room was called “the Holy Place” (1 Kings 8:8). It contained five pairs of golden lampstands, a table for showbread, and a golden incense altar (1 Kings 7:48-49). The innermost room of the Temple was actually called “the Most Holy Place” (1 Kings 6:16 NLT). The two large figures depicted cherubim that are thought to be heavenly beings (1 Kings 6:23-28). The cloud and light were our visual representation of the presence and glory of God that appeared. The Bible tells us, When the priests came out of the Holy Place, a thick cloud filled the Temple of the LORD. The priests could not continue their service because of the cloud, for the glorious presence of the LORD filled the Temple of the LORD (1 Kings 8:10–11 NLT). Why did you show only part of King Solomon’s prayer at the Temple? Why did you only show part of King Solomon’s address to the people? Which Bible version did you use for King Solomon’s prayer and address at the Temple? Is Solomon’s Temple still standing today? God had sworn to Abraham, Isaac and Jacob to give them the land of Canaan (Genesis 15:16-21; 26:3; 28:13-15). When the Israelites approached the Promised Land, He told them, “Look, I am giving all this land to you! Go in and occupy it, for it is the land the LORD swore to give to your ancestors Abraham, Isaac, and Jacob, and to all their descendants” (Deuteronomy 1:8, NLT). In addition, they did not believe God’s promise to them. He said to them, “But listen carefully to everything I command you today. Then I will go ahead of you and drive out the Amorites, Canaanites, Hittites, Perizzites, Hivites, and Jebusites” (Exodus 34:11, NLT). In their culture, tearing your clothes was an expression of great emotional distress. In this case, they were very upset that the people not only believed the bad report but were also rebelling against God’s will for them to take the Promised Land. They had disobeyed Him too many times despite seeing many awesome miracles performed (Numbers 14:21-22), and they had treated Him with contempt (v. 23). He knew that they were entrenched in their unbelieving ways and that a new generation of younger people who would believe Him should be the ones to enter the Promised Land. God instructed Moses to tell the people, “You said your children would be carried off as plunder. Well, I will bring them safely into the land, and they will enjoy what you have despised” (Numbers 14:31, NLT). If you are already a believer, then you are part of God’s spiritual family (John 1:12), and a sin will not break your relationship with Him (1 John 1:7). God is loving, patient and merciful. The Bible tells us, “The faithful love of the LORD never ends! His mercies never cease. Great is his faithfulness; his mercies begin afresh each morning” (Lamentations 3:22-23, NLT). In addition, God says, “I will never leave you nor forsake you” (Hebrews 13:5, ESV). When you confess your sins to the Lord, He will always forgive your sins (1 John 1:9). Why were the trees so dry and barren? Gizmo doesn’t actually eat pizza, but he enjoys the festive atmosphere, smiles, and good feelings of the people around him. The Lord commanded them to do so. We can see this in what God told Elijah: “‘Drink from the brook and eat what the ravens bring you, for I have commanded them to bring you food’” (1 Kings 17:4, NLT). The room may have been Elijah’s normal place of prayer. How did Jesus glow when He prayed in the Garden? The divine glory that was inside of Him, but normally unseen, was revealed in a spectacular way so that He shined with heavenly splendor. The Bible describes it this way: “As the men watched, Jesus’ appearance was transformed so that his face shone like the sun, and his clothes became as white as light” (Matthew 17:2 NLT). We used artistic license to portray the demon’s malevolent control of his body as well as the harmful effects the demon had on the boy’s well-being. We wanted the demon’s appearance to reflect its wicked nature. Why didn’t you have Jesus say that this type of demon only comes out through “prayer and fasting”? Although translations, like the King James Version and New King James Version, include the two words “and fasting,” a number of the best Greek manuscripts containing this verse do not. As a result, many Bible versions do not include those words either. We chose to use the wording of the aforementioned Greek manuscripts and many modern Bible versions. Did God really touch Jeremiah’s mouth? Yes! This is what Jeremiah wrote about it: “Then the LORD reached out and touched my mouth and said, ‘Look, I have put my words in your mouth! Today I appoint you to stand up against nations and kingdoms. Some you must uproot and tear down, destroy and overthrow. Others you must build up and plant’” (Jeremiah 1:9-10, NLT). Why did Chris’ game gear disappear in the Superbook Time Tunnel? What was the glow surrounding Jeremiah after the potter’s jar did not turn out as he had hoped? Yes, he was. The Bible tells us, “Now Pashhur son of Immer, the priest in charge of the Temple of the LORD, heard what Jeremiah was prophesying. So he arrested Jeremiah the prophet and had him whipped and put in stocks at the Benjamin Gate of the LORD’s Temple” (Jeremiah 20:1-2, NLT). We wanted to show that despite being whipped, Jeremiah was faithful to continue obeying the Lord. We also wanted to be historically accurate about what occurred. In addition, we included notices on the DVD packaging and in the Family Discussion Guide encouraging parents to view the episode before showing it to their children. When Joy first saw Mary, the mother of Jesus, she asked if they had met before. Why did they not recognize each other from “The First Christmas”? Joy did not recognize Mary because she was 30 years older. Mary did not recognize Joy because she (Mary) would have expected Joy to have grown up to be a woman. In addition, 30 years had passed since their time together, so Mary may have forgotten Joy’s appearance. Why did the servants (Chris and Micah) wash the guests’ feet when they arrived? Many of the guests would have walked a long distance in sandals on dusty roads, so their feet would have been dusty. It was an expected part of being a good host to have servants wash the guests’ feet. Since Mary chose not to accept Jesus’ initial disapproval of her request, and she instructed the servants to do whatever Jesus told them to do, we used creative license to depict what may have happened during their interaction. Baruch atah, Adonai Eloheinu, melech ha’olam, hamotzi lechem min ha’aretz. Why didn’t Mary and Joseph know sooner that Jesus was not with them? Joseph and Mary were probably part of a group that had travelled together from Nazareth to Jerusalem and was then returning to Nazareth after celebrating the Passover. Travelling together gave them added protection and the ability to share resources. Since they were all one tight-knit group, Joseph and Mary thought that Jesus was with the other children. Why did Joseph say that since Jesus was 12 years old He was “almost a man”? Although Satan is not God nor the Creator of this world, the apostle Paul wrote that Satan is the god of this world: “Satan, who is the god of this world, has blinded the minds of those who don’t believe” (2 Corinthians 4:4 NLT). At least two other Bible versions (NIV, LEB) use the phrase “god of this age” in this verse. In addition, Jesus called Satan the ruler of this world (John 14:30). While Satan still has a hold over the world (1 John 5:19), we should remember that Jesus defeated him (Hebrews 2:14). In addition, Jesus has given us authority over the enemy (Matthew 16:17, Luke 10:19). As God’s children, He gives us victory over the evil in this world (1 John 4:4, 5:4). Why did you show a promotion of a violent and hideous holographic game? “Blades of Bedlam III” was described as being for kids 17 and over. In today’s culture, kids may be exposed to advertisements for violent video games. We wanted to show that they shouldn’t give in to temptation and peer pressure. Why did Joseph and Mary not recognize Chris and Joy from “The First Christmas”? Joseph and Mary’s minds were preoccupied with thoughts of finding Jesus. In addition, they would have expected Chris and Joy to be 12 years older since the time when Jesus was born. We used creative license to show that Satan brings death and destruction. Jesus once stated, “The thief’s purpose is to steal and kill and destroy. My purpose is to give them a rich and satisfying life” (John 10:10 NLT). What did Jesus mean when He said that He had to be about His “Father’s” business? God has guardian angels that help protect us, but we should not presume that an angel will save us from a fall. We should not be careless or reckless. Instead, we should exercise appropriate caution and wisdom. As Jesus said, “You must not test the LORD your God” (Luke 4:12 NLT). We used creative license to show how cunning and tricky Satan can be in tempting us to sin. In this case, he was tempting Jesus to jump off the Temple. The apostle Paul wrote about Satan, “For we are familiar with his evil schemes” (2 Corinthians 2:11 NLT). We used creative license to show how they may have strengthened Him after His 40-day fast and being tempted by Satan. The Bible tells us, “Then the devil went away, and angels came and took care of Jesus” (Matthew 4:11 NLT). What was the large building in the first scene? It was the Temple in Jerusalem. We used artistic license to show Paul being filled with the Holy Spirit and receiving a prophetic message from God. The Bible tells us, Saul, also known as Paul, was filled with the Holy Spirit, and he looked the sorcerer in the eye. Then he said… (Acts 13:9-10 NLT). We used artistic license to show, from the sorcerer’s perspective, how his eyesight began to disappear. The Bible tells us, Instantly mist and darkness came over the man’s eyes, and he began groping around begging for someone to take his hand and lead him (Acts 13:11 NLT). They were speaking from Psalm 138: Though I walk in the midst of trouble, You will revive me; You will stretch out Your hand against the wrath of my enemies, and Your right hand will save me (v. 7 NKJV). The LORD will work out his plans for my life… (v. 8 NLT). You will need your partner number to activate the streaming. It can be found on your Superbook Club receipt. Be sure to make a note of the activation email address and password as they will be needed to log in to Superbook streaming through the Superbook.CBN.com website, Superbook Kids Bible App, and CBN TV Smart TV app. We appreciate your interest in the Superbook videos; however, we have no plans at this time to release Superbook on Blu-Ray. On the other hand, when you sign up for the Superbook Club, you get access to HD quality streaming!